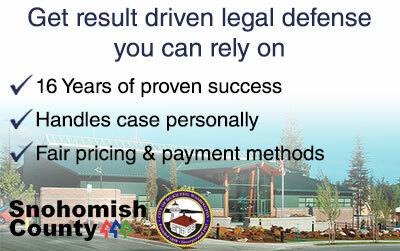 Are you looking for an Mukilteo criminal defense attorney with a proven track record for success? Look no further, my name is Schoen Parnell and I have over 16 years of experience defending clients who were arrested in Mukilteo, WA. Being charged with a crime can be one of the most stressful experiences in someone’s life. A criminal conviction could mean you will have to live with the consequences for a long time. You will want to aggressively fight your case to either reduce the charges to a lesser offense or move for dismissal to avoid jail time and expensive fines. As your criminal defense lawyer I’m here to help guide you so you don’t have to go through this process alone. I personally represent all of my clients unlike many other large law firms who advertise their most seasoned attorneys only to assign someone with little real experience to work your case. Not me! All of my clients know if they call my office or cell it is me who will pick up. Over the years I’ve gathered a solid network of resources and vetted criminal defense strategies to achieve not guilty verdicts for clients facing charges ranging anywhere from DUI to Murder One.Call me today to schedule some time for us to discuss your case. During your initial consultation we will be able review what kind of consequences or obstacles you may be up against and how I can help. If you’ve been arrested by a Mukilteo city police officer you could be held temporarily in the city police department’s jail located at 10500 47th Place W Mukilteo, WA 98275. However usually all inmates are booked into the Snohomish County Jail. Due to it’s size Mukilteo does not have it’s own courthouse instead all it’s criminal cases are held at the Snohomish County District Court’s Everett Division located in downtown Everett. The city contracts with a private law firm named Zachor & Thomas who also represents several other municipalities in Snohomish county to prosecute it’s criminal cases. It’s common for this firm to schedule arraignments for arrests made in Mukilteo within a couple of days of the arrest, so it is important to hire an attorney as soon as possible to be present with you at your first court appearance.